These one of a kind tapestries will help transform your room into your private sanctuary! Perfect for any room including living rooms, bedrooms dining and dorm rooms. It can be used in different ways to decor home like as bedspread, tapestry, wall hanging, bed cover, coverlet, sofa cover. Made from high quality 100% polyester. With high resolution pictures it will bring a 3D like realistic experience adding a great perspective & completely changing the look of a room.It's a quick and luxurious way to refresh the your home, office, study, basement or college dorm room without a big expense. Perfect gift idea for your mother, father, sister, brother, grandma, grandpa, wife, husband, son, daughter and all other beloved ones with 10's of thousands of surprising designs. You can find a theme for everyone and every interest in our iPrint Amazon Collection. Enter into a new world with this art tapestry, it can be at a seashore scene or meditate while staring at a mountain landscape scenery. If you're a fan of sports or have a hobby of any kind, you will be spending time with it in your own personal space. We follow current trends and bring you the latest home fashion. Either a present to your family or best friend, fiance, parents, grandparents, relative, boyfriend, girlfriend, grandson, or to yourself, the item should be interesting and authentic. Men, women, kids, teens, boys, girls will love this item! 01.The digital images we display have the most accurate color possible, however due to differences in computer monitors, we cannot be responsible for variations in color between the actual product and your screen. 02.You can easily hang the tapestries up with pins.Tapestries do not have a rod pocket. No hardware is included. [iPrint Design] This wall hanging made of 100% lightweight polyester with printed front and hand-sewn finished edges, features a classic theme, which can blend with any existing home decor. Printing on one side will be a valuable addition to your room. [Function] Bold graphics printed with state of the art digital printing technology.Featuring vivid colors and crisp lines, these highly unique and versatile tapestries are durable enough for both indoor and outdoor use. It can be used as a bedspread, wall hanging, bed cover, coverlet, sofa cover, tablecloth, beach blanket, pick nick blanket and more! [Size]91 INCHES WIDE x 60 INCHES LONG,if you need other size,please contact us,we will custom it for you. [Care Instructions] Machine washable in cold water with mild detergent and hang to dry. Don't bleach or tumble dry. The Color will stay nice and vibrant for years.Durable enough for both indoor and outdoor use. [Satisfaction Guarantee] Take iPrint wall art to your home to give your bathroom a vivid look. If you have any problem or suggestion, please kindly contact us, we provide support for you within 24 hours. 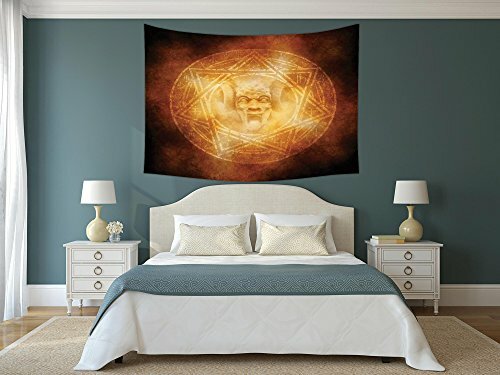 longbuyer Horror HouseBed Cover Blanket CurtainDemon Trap Symbol Logo Ceremony Creepy Scary Ritual Fantasy Paranormal Designfor Living RoomL59.1 xH82.7 Orange.